The BEST place to promote ebay listings! 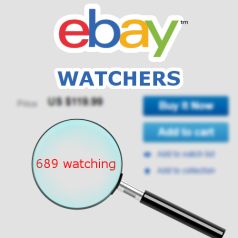 What is a Watcher on eBay? We are glad you are here! You have just landed on the website that supports your perfect and flawless eBay promotion through organic traffic. We work with hundreds of sellers and merchants of different types to increase sales and revenue through increased daily views on their listings. We have recorded lots of success in doing this that many of our esteemed clients have stuck to our enviable service for years on a long term contract. WatchersUp has succeeded in achieving success based on innovative ways and the method we have incorporated into eBay promotion that has produced massive results for clients. We are 5 years in the business and we are only proud to have achieved as regards to the happiness our eBay merchants find and relish using our service which strives to increase impression through organic basis. 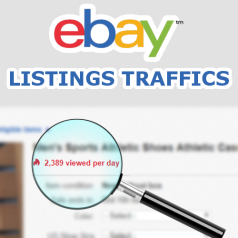 Apart from our very famous eBay watchers service, we also offer eBay traffic for your listings and eBay profile views and all are done with great in-depth of our understanding of the eBay network to ensure and assure positive result. Our major service is the eBay watchers service. For every product listed on eBay, there is a red color that indicates the number of watchers of such a product beneath it. What we offer in respect to the number of watchers is to boost and increase it to the number you want in other to easily improve your product reach, visibility and impression. Increased number of watchers will always have the attention of interested buyers as a popular product that is good to buy or advertise. This will in turn bring lots of sales for that product. Watchersup also provide eBay listing traffic service. The eBay listing traffic provides organic users to click, visit and view your listings and ensures that your listings get the popular rating that gives a positive perception to other users about your listings with the associated benefit of having eBay network promote your listings in their network and suggest it to users to boost your revenue though sales. The eBay listing traffic is a very effective service and when used with the eBay watchers, the result is usually explosive. We also offer the eBay profile views which is also an innovative service that is only reputed to us worldwide. The service provides users to view your profile in such a way to draw up potential buyers through high number of profile views. On the eBay network, buyers always check for reputation of merchants before buying and in cases where the buyers are not convinced about the reputation of the merchant, they refuse to buy and seek other merchants with the required credibility. 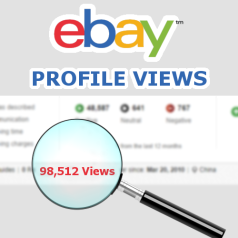 The eBay profile views is so crucial in this area because it provides you with the needed amount of credibility and reputation to have interested buyers stay glued to your listing and make purchase. As part of our effort to see that you make sales on the eBay network, we provide you the opportunity to subscribe to any of our services and get it distributed on up to fifteen (15) separate listings. You may also check each of the services to be more informed about how each work including the terms while you can also contact us via the responsive Email or the live chat.